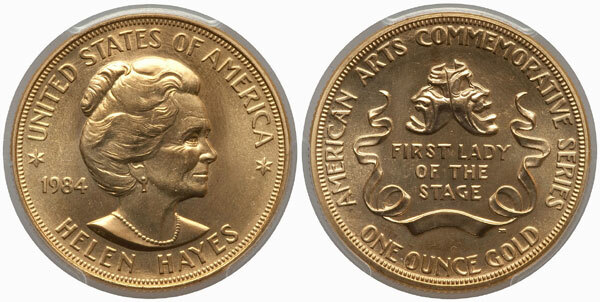 The fifth and final year of the American Arts Commemorative Series included a one ounce gold medallion featuring actress Helen Hayes. Her career spanned nearly 80 years and included film, stage, and television roles. She won an Emmy, a Grammy, an Oscar, and a Tony Award, as well as received the Presidential Medal of Freedom and National Medal of the Arts. On the obverse of the medallion is a right facing profile portrait of the actress. She appears in her later years and carries a pleasant expression. Her hair is worn up and she is adorned with pearls and earrings. On the reverse are the two masks of comedy and tragedy with a ribbon framing the words “First Lady of the Stage”. The obverse contains the inscriptions “United States of America”, “Helen Hayes”, and “1984”. The reverse contains the additional inscriptions “American Arts Commemorative Series” and “One Ounce Gold”. The method of distribution of the medallions was altered once again for the final year of the series. The previous distributor J. Aron & Company was let out of its contract and instead the United States Mint would sell the medallions directly to the public through a telephone ordering system. Initially, remaining inventories of all medals were offered individually, but later sets of either the one ounce or one-half ounce medals were offered. The Helen Hayes American Arts Gold Medallion had a mintage of 35,000, representing the low for the series. From this amount, sales reached 33,546 pieces. The impact of melting was not as pronounced for this year, since the medals were sold directly to collectors and purchasers of the previous medals. After the Alexander Calder Medal, both of the 1984 medals are seen as the next scarcest of the series.